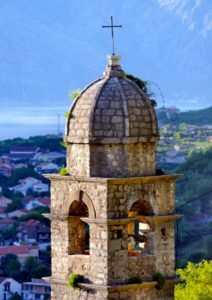 One of our favorite experiences in Kotor was hiking to the Fortress of San Giovanni, or Castle of Saint John, 1,200 meters or 3,600 feet above the harbor. The view from the top is literally breathtaking…okay, maybe the panting had something to do with the climb. Our intention was to take drone footage from the summit and see what kind of pictures we would get. They exceeded our expectations in their beauty and dramatic perspective. For a change, I (Ellen) carried the drone backpack on the hike, which definitely helped me get a good workout. Rand operated the drone. Here are the results of our joint effort: take a look. We deliberately timed our climb for first thing in the morning and were on the mountain by 7:30 a.m. This allowed us to climb when it was cooler and also have the light behind us, shining on the fjord and opposite bank of Muo where Golden Glow was moored. 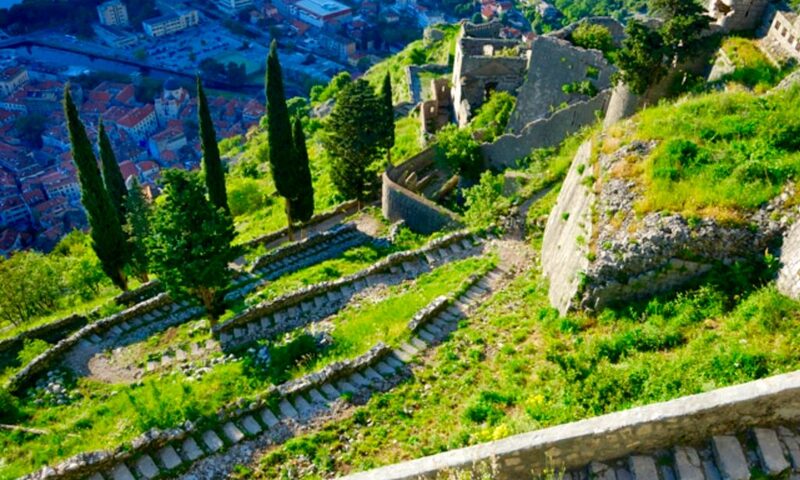 The fortress dates back to medieval times, built on and off between the 9th and 19th centuries by varied local inhabitants of the area, from the Byzantines to the Venetians.